EDIT: These days, please harvest amplifier chips from active computer speakers instead. They are plentiful and contain only what you need in a nice package. I liked TDA1517P, because it had so few additional components. 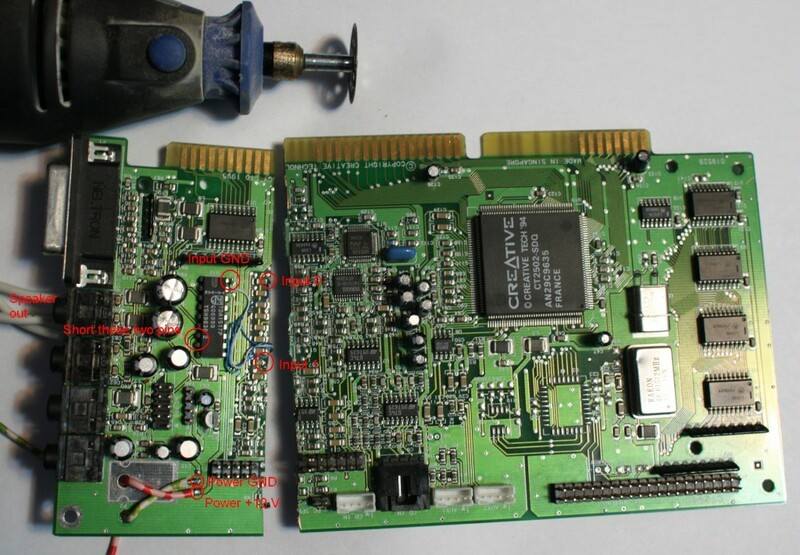 The amplifier part (left) of Sound Blaster 16 CT2940, cut off with a diamond cutting wheel. Jump wires were soldered to route input from Line In, and wires were added for 12 V power input (shared ground with signal). Two pins of the TDA1517P amplifier were shorted to enable the chip. A voltage regulator was also removed, as it was not used by the amplifier. I was going to ask if you would snail-mail the unused card half to me, but I may already have a SB with YMF289. I think I’ll leave my card intact, But I could salvage the YMF289 and control it with parallel port or microcontroller in some project. Do you happen to have extra sound cards with OPL2 chips by the way? I think I have enough OPL3 chips already..
Drop me an e-mail with your address. I can mutilate the card further and send you the section that interests you. I have an Adlib, but if you want it then you have to give a really good reason… :) I’m thinking I’d some day measure the impulse response of its output. For that authentic sound you know! they’re getting harder and harder to find..
Ouch, one of the more desirable Sound Blaster 16’s with the combo of Vibra 16 Pro CT2502 and discreet OPL3-L. I just paid a decent chunk of cash for one! Geez, someone just sold an Adlib for 200 USD on eBay. I got to hold on to mine with a death grip! I made the cut very fast so the card did not suffer MUCH. I once tried this trick, but just soldering the wire in parallel and not cutting the remains (it was on an extra slot that was beyond motherboard’s card connectors). These days the 5 wires are unsoldered and the card has served happily in my retro dos box, when I realized that the parts are getting rare and that most >=awe32 cards are actually crap in some dos games because of creatives wrong sounding opl clone. ESS cards are much better if you want an OPL that is a clone but a good sounding one. This is retarded, but then Scandinavia kind of is the retard capital.